A nifty screen on the Droid Bionic reviews which activities have been consuming power when the phone is operating from its battery. The informative screen is shown in this figure. Choose Settings and then Battery & Data Manager. You see a wonderfully big graphical battery meter. It’s pretty, but it’s not your final destination. Touch the big Battery icon. You see a screen similar to the one shown in the figure. The number and variety of items listed on the Battery Use screen depend on what you’ve been doing with your phone between charges and how many different programs you’re using. Maximum Battery Saver: In this most restrictive mode, the phone dims the display and disables automatic synchronization after 15 minutes of inactivity. 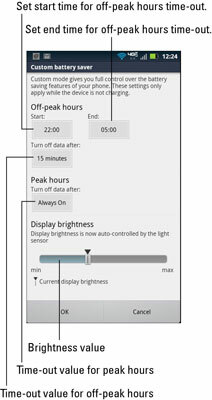 Nighttime Saver: In this mode, the phone uses Performance mode (no battery savings) during daytime hours but switches to Maximum Battery Saver mode between 10 p.m. and 5 a.m. Performance Mode: In this mode, nothing is held back and no time-outs are set. It is, essentially, no power management. Custom Battery Saver: This mode allows you to configure timeout, brightness, and peak usage times yourself. Choose a battery profile from the list. Read the warning message and touch the OK button. Configure Custom Battery Saver mode by touching the icon (shown) to the right of that option. You can then use the screen that appears, shown in this figure, to configure its options, time-outs, and other settings.